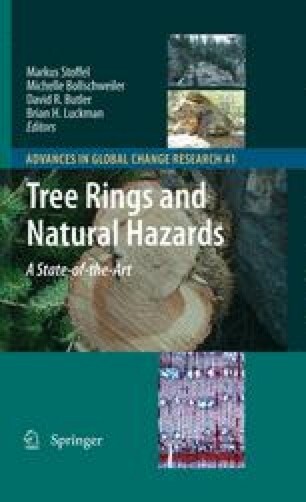 Because many tree species can live for several centuries or longer (Brown 1996), tree-ring analysis can be a valuable tool to date geomorphic events such as landslides, earthquakes, and avalanches in regions lacking long historical records. Typically, a catastrophic landslide will destroy all trees on the landslide, but trees on slower moving landslides may survive. For example, the Slumgullion earthflow, in southwestern Colorado, moves 0.5–5.5 m annually, yet is covered by aspen (Populus tremuloides) and conifers (Baum and Fleming 1996). Trees that survive such movements undoubtedly suffer damage, such as topping, tilting, impact, or root breakage. This damage is commonly recorded in the tree-ring record and analysis of this record can be used to reconstruct past landslide activity.